Still Working On New Year’s Resolutions? Making New Year’s Resolutions, a practice that existed as far back as the early Babylonians, is a growing American pastime. In the early 20th century about 25% of Americans made New Year’s Resolutions. 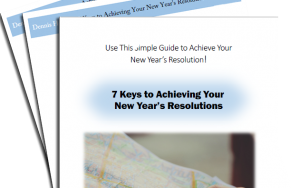 Today, over 50% of Americans participate in the practice of making New Year’s Resolutions. So with the growing popularity of making New Year’s Resolutions, you might reasonably conclude that they are effective; that people accomplish great things by setting goals or making commitments at the beginning of the year. When thinking about making a resolution, first consider the motivation. If your motivation is external, if you are setting your goal because someone else wants you to or thinks you should, you are less likely to succeed. Choose a goal that is important to you. The more important, the more it speaks to your deepest core values, the greater will be your ability to push through the ups and downs that you will encounter. Make sure that your goals and objectives are reasonable and attainable. If you are currently working part time and have no skills, earning a million dollars in the next twelve months may not be attainable. However, setting a goal to begin getting the training or doing the things you need to become an entrepreneur might be. Losing 50 pounds in a month is not attainable, but losing 8 pounds in a month and 50 pounds in 6 months might be. At first glance, the cruise control in your car may seem to lock your engine onto a constant speed. In reality, it locks onto a target speed, then constantly adjusts the accelerator making the engine run faster or slower in order to stay on target. Rather than one constant and unchanging effort at the target speed, it is a series of many small adjustments made in response to constant monitoring. Pursuing our target goal is like that. We need to monitor our progress on a regular basis and adjust our activities as necessary to ensure that are actions are aligned with our goals. Stanley Hall once wrote, “Man is largely a creature of habit…” Much of our time is engaged in habitual behavior. Some of it is intentional, conscious, and productive, but some of it is not. Sometimes we develop habits that thwart our attempts to succeed. It is critically important to work the activities that will lead to your goal into a regular habit, displacing the bad habits that keep you from reaching your goal. encounter situations that were impossible to anticipate. That’s ok. Adjust and continue. Keep your final goal in the forefront of your mind.